I decided to make Ina Garten’s macaroni and cheese recipe this past weekend, and coincidentally I’m realizing I shared it over 10 years ago on my first blog Mona’s Apple. Me. It’s so good it warranted another entry in the event some might find it here via Google search. We just had our first FET (frozen embryo transfer) of our first IVF cycle on Wednesday. Since I stopped drinking, with hopes the embryo is planting itself in my belly as I type, and wine typically gives me comfort, I opted for comfort food instead. I made this mac and cheese on Saturday and a cobbler recipe on Sunday (though the latter is not worth sharing, unfortunately). My one comment on this (and I noted the same thing the first go around in ’05) is it ends up being a very creamy, white macaroni and cheese. IMHO it’s even better on the second day because the cheesy sauce has coagulated a bit in the fridge. If you’re looking for a real orange, cheddar-based macaroni and cheese, maybe switch the cheeses up and cut the milk in half. Melt 3/4 of the stick of butter and whisk the cup of flour in until you have a paste-y texture. While you’re melting butter and whisking, pour the milk in a saucepan and heat (do NOT boil). Boil water for the noodles. Add noodles. Cook them for about 6 minutes. You want to UNDERCOOK the noodles as they will continue to cook in the oven. Grate all the cheese and mix with the spices (salt, pepper and nutmeg). Add the hot milk to the butter/flour mixture. Stir for about 10 minutes until you have a thickened and smooth texture. Take the milk mixture OFF the stove now and pour in a bowl. Add the cheese and spices and fold. Melt the remainder of the butter stick in a small saucepan and add the breadcrumbs. When browned take off the heat. Once the pasta is done, drain it well and, emptying the water from the saucepan it came from, pour the pasta back into the now empty saucepan. Add the cheese roux. You’ll want to stir the roux/pasta in the saucepan rather than in the baking dish. 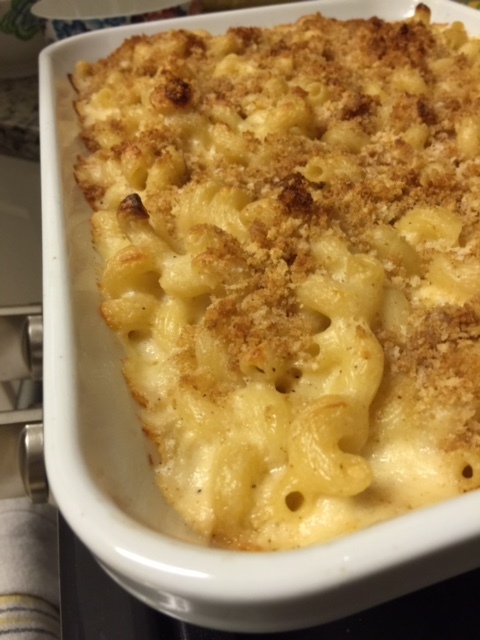 Pour the mac and cheesy goodness into the baking dish and sprinkle with breadcrumbs (can be fresh or store-bought). Bake in oven for about 30 minutes, until cheese is bubbling and breadcrumbs are browned on top. If you want to get really crazy, broil it for a few seconds.